VyCAP offers solutions to enumerate CTC in mouse blood, which enables researchers to improve and expand their research. Mouse xenograft models are used to study tumour evolution and the efficacy of anti-cancer therapeutics. CTC in mouse contain detailed information about the cancer development. Enumerate CTC easily and reliably with limited hands-on time is established by using size based filtration. Circulting tumor cells are filtered from the blood by their larger size and higher rigidity compared to other blood cells. VyCAP offers a complete, simple, validated and automated solution to enumerate CTC in mouse. The workflow to filter whole blood from mouse is validated, automated and simple. It takes less than 1 hr to process and enumerate circulating tumor cells. The mice blood is collected using an EDTA or heparine tube, from the mandibular vein or hart puncture (0,1 – 1 ml). Next, the blood is pre-filtered with a nylon filter (30µm mesh size) to remove larger clots, mouse hairs / debris. The pre-filtered blood is transferred to VyCAP’s filtration disposable and the filtration is started. For fluorescence labeling, the microsieve filter with the collected CTC is transferred to our cellstainer. Using the cellstainer, labeling of the collected cells becomes simple and straightforward without loosing the collected cells. Fluorescence images of the collected CTC are acquired using VyCAP’s automated imaging system. This imaging system is optimized to count and identify CTCs. However other fluorescence microscopes can also be used. 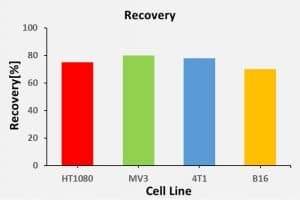 The graph below shows the recovery of different cell lines that are commonly used in mouse model systems. The cells were spiked in mouse blood and next filtered, followed by labeling, imaging and enumeration. 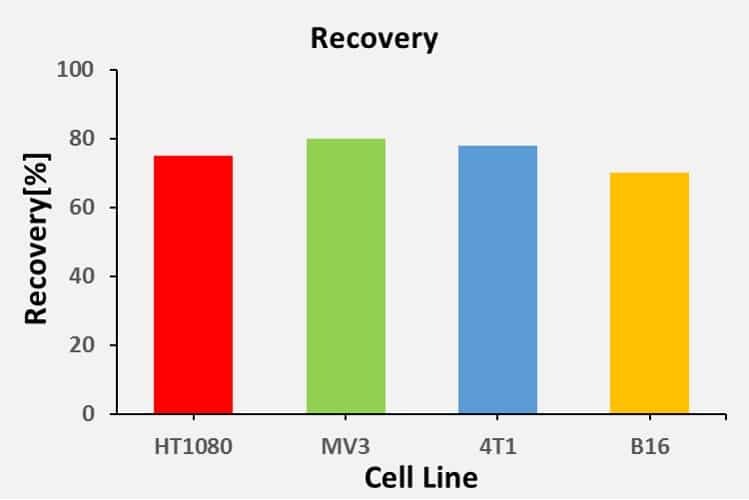 The graph below present the recovery for a cell lines commonly used in mice models. The image below depicts a mouse CTC cluster captured on a VyCAP sieve, as well as some leukocytes. Mice were engraftment with the PANC-1 cancer cell lines and the cancer tumor evolution was studied over time. CTC were enumerated at the end point, in 100µl blood obtained by heart puncture, that was next fixated using Transfix. Blood was filtered and labelled with fluorescence labels against anti-human Cytokeratin and anti-mouse CD45.2, according our protocol for CTC enumeration in mice. 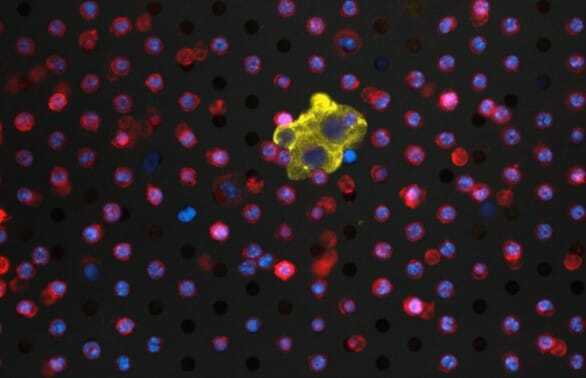 The image below shows an image of mouse leukocytes and a human PANC-1 CTC cluster on a microsieve. Number of CTC found in these mice was between 10 and > 800.